Intuition or sixth sense guides us through life where our rationality and judgement falls short; it assesses our environment in ways we cannot perceive. Our intuition flows as fluid as the transient Universe itself. Often we hear people saying that their gut says that something’s not right, or that they have a feeling it’s going to be a good day. Intuition is often also associated with the heart, in lieu of the whimsical and inexplicable urge that beckons us. We plant it against the brain, the logic centre of the body. This gives rise to the countless quotes and sayings we have heard, in real life and on digital and print media about listening to our hearts, letting it lead the way. Intuition works a lot on our belief in it, much like a nagging Tinker Bells inside our heads. Some attribute a greater number of their achievements and better decisions in life to their gut feeling, while many others do not believe in its existence at all. Everyone can put their intuition to work, they need only try and give it room to strengthen and flourish. Nevertheless, some are just inherently better at it, ruled by the planets and constellations that they are. 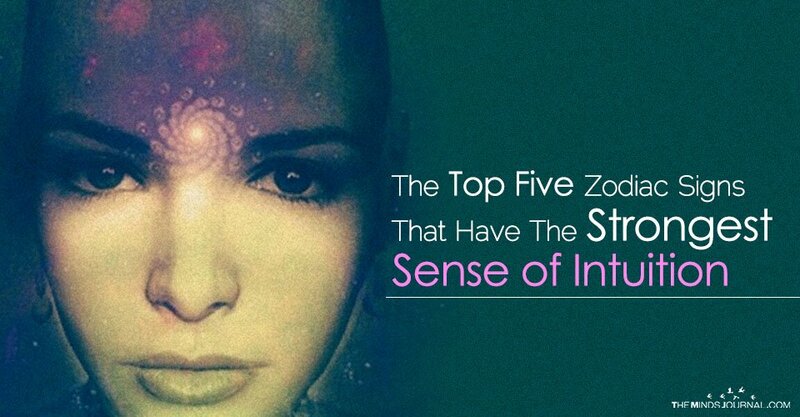 And thus the strength of the gut over the mind seems especially strong in some of the Zodiac signs than in the others, and thus we bring you five of the most intuitive signs, known to let their gut and their hearts lead the way. The perfectionists of the Zodiac, Virgos want things done right down to a T. Their keen sense of observation and their analytical mind, coupled with their strong intuition makes sure nothing slips their eye. They can trace the most imperceptible of changes in the Universe and work accordingly. This makes them inflexible but successful editors and curators, their rigorous analysis not pardoning the tiniest of errors. Virgos are paradoxical, one of the most rational signs of the Zodiac, and one of the most intuitive ones as well. The warrior sign, Aries has a knack for sensing brewing conflicts. Their love and weakness for competition and strife – both physical and mental, makes them prone to unnecessary risk-taking, although they usually come out of the mess unscathed. Thanks to their strong intuition. Being the carelessly reckless people that they are, their intuition guides them and does some of the judging for them. Their gut warns them about people, putting forward possible ulterior motives and manipulation. The alarm bells going off in Aries minds in times of crises are usually pretty accurate.